Easy to Read and Implement Python Programming For Beginners. Python is a highly functional and flexible programming language that delivers a powerful experience to programmers and users alike. Python is known for being a language of simplicity. By its nature, it is inherently easier to read than other programming languages. That is why Python is so beginner friendly! It is the ideal language for first-time programmers who want a flexible language for web development. Python is powerful enough for both big and small development projects – online or off. Python is fast, cutting development time into half of what it would normally be. The languages syntax is simple and to the point, making it an ideal intro language for those that have never programmed before. Most Python programmers contain about half of the lines of code that would be required in other languages. Python also comes with a built in debugger, making troubleshooting a breeze. 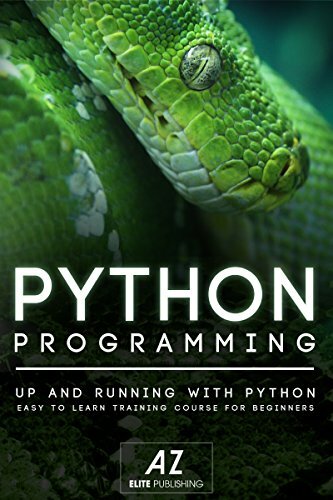 In this eBook, we will show you how to quickly jump head-first into Python programming. Covering more than 25 topics in total, we will present you with information, then walk you through the process of creating example projects across each of these subjects. This comprehensive guide covers basic and advanced concepts, allowing you to start programming in Python right away. By the end of this guide, you will be able to efficiently code your own Python programs and see your ideas come to life. Python is a language that has grown quickly in popularity over the course of the last decade. There is more demand now than ever for Python development, with some of the largest tech companies in the world utilizing it. This guide can teach any new programmer how to efficiently create their first Python programs. By the end of the book, you will be able to program on your own, and create your own programs from scratch. Python is a versatile language that is an excellent choice for future web developers.